This week marks the 14th annual Global Asbestos Awareness Week. This year, the campaign focuses on banning asbestos, preventing exposure, enforcing regulations and strengthening international partnerships. It’s easy to assume that asbestos exposure is a risk of the past. Most Americans think asbestos was banned long ago. The U.S. Environmental Protection Agency (EPA) tried to enact a ban in 1989, but the Fifth Circuit Court of Appeals overturned it. Asbestos use is regulated in the U.S., but not banned. Only a handful of products, such as flooring felt, spray-on insulation and commercial paper, cannot contain asbestos. Many products are legally allowed to contain asbestos, and most of them are construction materials. Because asbestos is so widely used in construction, places we regularly associate with safety are a source of asbestos exposure. Churches, schools, public buildings, hospitals and your own home are among places that may contain asbestos. Make sure your family and loved ones know the places where asbestos may be lurking. The only way to prevent mesothelioma and asbestosis is to avoid asbestos exposure. Churches primarily used asbestos materials for soundproofing and fire prevention. People don’t often associate asbestos with soundproofing, but asbestos was added to acoustical panels to make them stronger. Acoustical panels were used on walls and ceilings to soften the echo and reverb of music played inside churches. Asbestos was also used to insulate church organ blowers and bellows. Another form of asbestos insulation found in churches includes wrap insulation around boilers and steam pipes. Maintenance workers are the most at risk of asbestos exposure in churches. But anyone who works at a church, especially older churches, may encounter asbestos products. Asbestos is so prevalent in schools that the U.S. government created a separate set of regulations in 1986 to protect children and school employees. The Asbestos Hazard Emergency Response Act (AHERA) requires schools to inspect buildings for asbestos-containing materials, make asbestos management plans and take action to prevent and reduce asbestos exposure risks. Although AHERA was enacted in the late 1980s, asbestos remains a problem in schools. In 2017, the EPA awarded $631,000 to five New England state agencies to fund asbestos abatement projects and asbestos management plans. Any public building built before the 1980s is likely to contain asbestos-containing construction materials. Even new buildings are built with asbestos in roofing materials, vinyl tiles and cement piping. Examples of public buildings include government buildings, police stations, movie theaters, restaurants, barbershops and hair salons, grocery stores, shopping malls and airports. When asbestos is discovered in these buildings, federal regulations require building owners to safely abate and properly dispose of asbestos materials. Those who fail to follow regulations are fined. Some people have even served time in jail for violating asbestos laws. In 2014, asbestos was found in a Connecticut police station’s plaster ceiling. The Occupational Safety and Health Administration fined the Stamford Police Department $2,720 and issued five violations for improperly handling asbestos materials. Hospitals used asbestos products to prevent fires and keep medical equipment from overheating. Anyone who works in a hospital may come in contact with these products, but maintenance workers are most at risk of exposure. Demolition and construction workers who work on hospitals are also at risk. In 2011, the discovery of asbestos-contaminated flooring delayed plans to demolish Ivinson Hospital at the University of Wyoming. Asbestos in hospitals is also an international concern. The toxic mineral was widely used in Australian hospitals. There’s a good chance your home contains asbestos, even if it is a new home. People associate asbestos with older homes, but many new homes are constructed with asbestos materials. The most common asbestos construction materials used today include cement shingles, sheets and pipes, roofing and flooring materials, pipeline wrap and millboard. 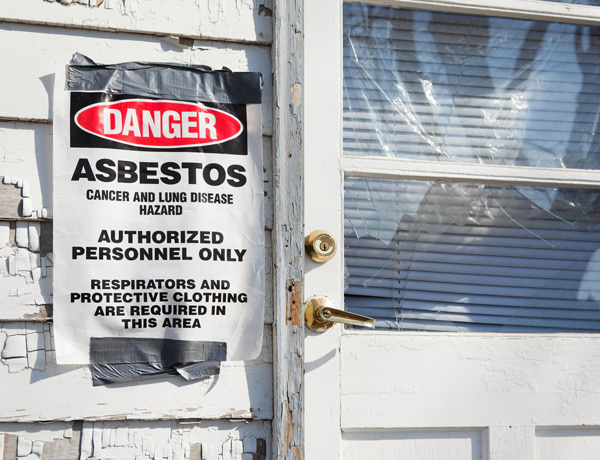 Homeowners are advised against performing their own do-it-yourself asbestos removal projects. It is important to hire a reputable asbestos abatement company to safely remove asbestos from your home. Abatement professionals know how to protect you and your family from unnecessary asbestos exposure. U.S. Environmental Protection Agency. (n.d.). Asbestos and School Buildings. U.S. Environmental Protection Agency. (n.d.). Learn About Asbestos. Healthcare Environmental Resource Center. (2015). Asbestos. U.S. Environmental Protection Agency. (2005, March 31). EPA Complaint Against Rhode Island Flooring Contractor Seeks $70,535 Penalty For Violations Related to Its Handling of Asbestos Flooring At Church Building. U.S. Environmental Protection Agency. (n.d.). U.S. Federal Bans on Asbestos. Ritchie, P. (2016, April 19). Asbestos issues in churches: What to spot.